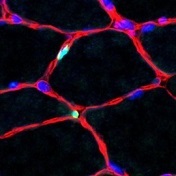 "At the same time, however, there needs to be a mechanism in the body that prevents an uncontrolled differentiation of stem cells -- because otherwise the supply of these cells in the muscles would be quickly depleted," says Professor Carmen Birchmeier, head of the research group on Developmental Biology / Signal Transduction at the Max Delbrück Center for Molecular Medicine in the Helmholtz Association (MDC). Birchmeier teamed up with colleagues from Berlin, Cologne, London, Paris, and Kyoto on mouse experiments that examined how this mechanism works. The group of researchers has now reported in the journal Genes & Development that the MyoD and Hes1 proteins regulate the differentiation of muscle cells. They are produced in the stem cells in an oscillatory manner -- i.e., there are periodic fluctuations in the number of cells produced. "This observation, first of all, was astonishing in itself," says Birchmeier, "because no one before us had detected the oscillation of proteins in muscle." Such a phenomenon was previously only observed in stem cells of the brain. The MDC researcher hopes her studies will one day lead to better treatments of muscular dystrophies and of sarcopenia, a syndrome characterized by the progressive loss of muscle mass with advancing age. "In our experiments, we started off by connecting the Hes1 and MyoD to proteins to luminescent -- i.e., light-emitting -- proteins so that we could better track their development," explains Dr. Ines Lahmann, the study's lead author and a member of Birchmeier's research group. The team was then able to observe -- in isolated cells, in muscle tissue, and in living animals -- that the Hes1 protein, which is part of the Notch signaling pathway, is produced in an oscillatory manner. "Production reaches its peak every two to three hours and then declines again," reports Lahmann, adding that they encountered the same phenomenon in the MyoD protein. "As long as the quantity of MyoD in the stem cells fluctuates periodically, the cells grow and divide, thus renewing themselves," says Lahmann. This, according to her, ensures there is always a sufficient supply of stem cells in the muscle. When a muscle stem cell starts to differentiate and develop into a muscle cell, one result is the formation of long muscle fibers. This occurs, for example, when a muscle grows in a young organism or when it tries to repair itself after an injury. "Every time we observed this conversion of cells under the microscope, we had previously noticed that the oscillation had stopped and MyoD was expressed stably -- regardless of whether we were looking at newborn or adult animals," reports Birchmeier. Her team then proceeded to turn the gene for Hes1 completely off, so that the protein is no longer produced in the stem cells. The researchers also conducted this experiment on both cells and living animals. "The lack of Hes1 led to MyoD no longer being produced in an oscillatory manner, but rather in a stable pattern. All stem cells began to differentiate as a result," says Birchmeier. "Our experiments show that when it comes to stem cell differentiation and probably many other cellular processes, genes are not simply turned on or off -- and that we are still a long way from understanding all the developments that occur when we use genetic tricks to do exactly that," Birchmeier stressed. She and her team next want to study why the oscillation of MyoD leads to stem cell differentiation not taking place in the muscles, and why a stable production of the protein is needed to trigger this process. "Once we gain a better understanding of the whole process," says the researcher, "we will be able to better help people with muscular disorders whose natural capacity for muscle regeneration has been impaired." Illustration: The picture shows an immunohistochemical image of skeletal muscle. The nuclei of muscle stem cells are colored in green. The nuclei of the muscle fibers are shown in blue, the basal lamina around the muscle fibers in red. Scale 20 μm. Credit: Birchmeier Lab / MDC.